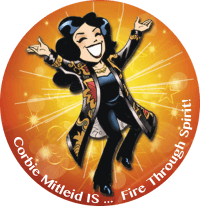 Corbie Mitleid | Have Your Own Psychic Party! PLEASE NOTE: Rates below are for standard parties only. For Holiday party and corporate rates (Halloween and the week between Christmas and New Year’s) please contact Corbie directly for availability and pricing. Want to get a reading but no time to make it to a show? Are you thinking of finding something new and different to do with your friends? Tired of the same old birthday parties and bridal showers? Try a psychic party — it’s like having your own personal psychic expo! WHEN PLANNING YOUR PARTY: My schedule books up months in advance for weekends, so it may be easier to book weekdays or weekday evenings; have a couple of alternate dates in mind. I can travel up to 3 hours away from home for parties; longer-distance parties are possible if arrangements are made, and can be discussed on a case-by-case basis. If you’re not local to Schoharie County NY, check and see when I’m doing a psychic fair or expo within an hour’s drive of your home. Private parties can be scheduled for the day before the show. Parties outside the Capital District (NY) area more than 60 miles from Cobleskill NY require a $40 travel charge. This charge does not apply to parties booked around psychic fairs if the party is less than 100 miles round trip from Corbie’s hotel. Parties cancelled fewer than seven (7) days before the scheduled date will be charged a $75 cancellation fee. When you book your party, a credit card will hold the spot, just as is required for private sessions. Parties are CASH ONLY events, unless arrangements are made at the time of booking. The hostess is responsible for collecting monies and paying in full at the end of the party. Each guest gets a half-hour to explore the “everyday tour bus” (relationships, family, jobs, finances, direction), karmic relationships, past lives, or spirit guides — or contact loved ones who have passed. The guest sets the priority on what is important for them to learn in the session; however, while I’m a skilled and to-the-point reader, not everything may be covered if the guest has a very long priority list. All sessions come with a complimentary CD, to ensure that the guest can review information at her leisure. YOU, as hostess, receive a special gift: your Numerology Life Report and twelve-month personal forecast FREE! A minimum of seven participants plus the host/ess is required for a party, and a maximum of 16. NOTE: All participants must be 18 or over! (If you are interested in a psychic party specifically for teenagers, please contact us for details.) The fee is $70 per person US ($80 in metro NYC, California and Canada). As useful as half-hour sessions are for information gathering, there are occasions (larger holiday open houses, Mardi Gras celebrations or bridal showers, for instance) where a mini-reading is the best option. Mini-readings are 15 minutes long. Attendance requirements are a minimum of 12 people plus the host/ess and a maximum of 25. If you are planning a larger event, talk with me! I can make it happen. The fee is $45 per person ($55 in metro NYC, California, and Canada). All you need to provide are a card table and a couple of comfortable chairs set up in a well-lighted quiet location, and a parking place close to your home, if not directly in your driveway. I bring the rest! Use our convenient booking form below and schedule your party today!